To thank my friends in Annagassan, Ireland, for all their help as I was doing the research for The Last Abbot of Linn Duachaill, I wrote a series of short plays about the history of the area, using the techniques of medieval drama, as if someone in the fifteenth century had dramatized their early medieval past. They were performed at the Annagassan Viking Festival in August 2012 and 2013. The Founding of Linn Duachaill. How Saint Colman expels a devil from a pool in the river and establishes a monastery, Linn Duachaill (which means ‘the pool of the devil’). A video of the performance can be watched here. The Fall of Linn Duachaill. How the Vikings, lead by the notorious Turges, attack and take Linn Duachaill in 841, and roast the abbot alive over a slow fire. A video of the performance can be watched here. The Freedom of Linn Duachaill. How the Ui Neill king Muirchertach Mac Neill leads an attack on the Vikings in 926. A video of the performance can be watched here. The Raid from the Linn Duachaill longphort upon Clonmacnois. In which Turges leads his motley band of Vikings to raid Clonmacnois and his badly behaved wife dances most disrespectfully on the altar. There are consequences. The Death of Turges. In which the clever Irish king Mael Sechnaill uses Turges’ desire to remarry, with Mael Sechnaill’s daughter as the bride, to capture the evil Viking. As I watched the performances I realized we’d inadvertently conducted a fascinating experiment in medieval drama reconstruction. Original practice productions of medieval drama attempt to perform the plays as close as possible to how it would have been done (in the same vein as London’s reconstructed Globe theater). However, an irretrievable element has always been the drama’s place within its society. 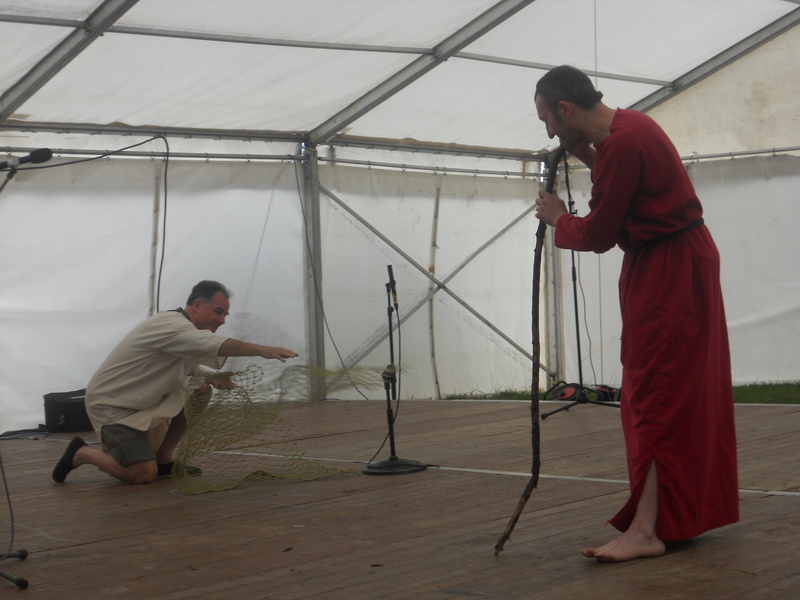 Here, we performed new, medieval-style plays within an existing tight-knit community, much more closely approximating a medieval performance’s cultural position than the random crowd of strangers gathered at most modern performances. I presented at the International Congress on Medieval Studies in May 2014 about what can be learned from our unintentional but informative experiment.